Chapman Tennessee Hildebrand ’17 (United States), the recipient of the 2017 Bertha Seifert Award for Excellence in Music, will pursue a degree in Music Industry Studies while also studying composition for media and film at Loyola University New Orleans. He was awarded the school’s largest merit scholarship. 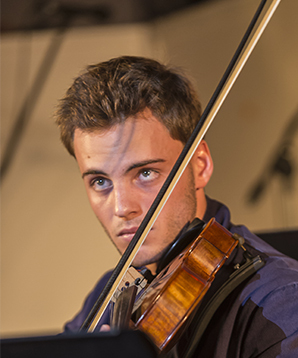 Prior to starting his collegiate career, Tennessee will take a gap year to spend five months studying Italian and learning how to hand-craft violins at the internationally renowned Academia Cremonensis in Cremona, Italy, the city known as the home of violin makers Stradivarius, Amati, and Guarneri. Tennessee also plans to return to India for three months to continue the admirable work he did during his senior year as a member of the Gram Vikas Global Service Program group. Tennessee certainly made the most of his one year at TASIS. He played the viola, mandolin, and guitar and was a standout performer at the 2017 Spring Arts Festival, excelled in the classroom—citing Mr. Todd Matthew’s AP English Literature and Composition course and Ms. Marzia Lecci’s Italian 1 course as classes that were particularly fun and challenging—created a number of excellent short films as a member of the Journalism and Video Production Internship team, set many school and conference records as the MVP for both the Varsity Cross Country and Varsity Track and Field teams, and won a TASIS Magnificent Seven Award for Humility.